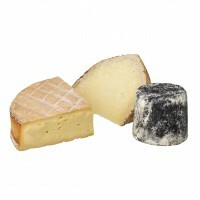 Three fantastic cheeses made in and around the lush countryside of the Cotswolds. A collection of artisan cheeses from in and around the glorious Cotswolds. This selection fits into one of our Small Gift Boxes. Berkswell (Unpasteurised Sheep's Milk, Traditional rennet) - a hard sheeps cheese with a distinctive rind and lively intense flavours. Rollright (Pasteurised Cows' Milk, Traditional rennet) - a soft, washed rind cheese with a buttery texture and a savoury, rich flavour. Mini Cerney (Pasteurised Goats' Milk, Vegetarian rennet) - a fresh flavoured cheese that has been rolled in ash and sea salt.